For highlighting information about human rights violations suffered by 31 Burmese Migrant Workers who were working at Asahi Kosei(M) Sdn Bhd, in Charles Hector Blog, HR Defender, Charles Hector, has been sued for RM10 million by the said company. ALIRAN has up a fund so that concerned groups and persons can contribute to the legal cost and expenses incurred by Charles Hector, Human Rights Defender, in the legal suit initiated by Asahi Kosei (M) Sdn Bhd. A lot of financial support is needed and your immediate assistance is needed. Malayan Banking Berhad, Green Lane branch, Penang, Malaysia. Please also email us at aliran@streamyx.com to indicate that it is a donation to Hector’s Legal Defence Fund. En août dernier, le procès de Charles Hector, avocat et défenseur des droits des travailleurs en Malaisie, s’est soldé par une condamnation pour diffamation. Le 15 décembre, une centaine d’organisations manifestent contre l’amendement de “l’Employment Act”. Entre les deux événements, il n’y a apparemment aucun rapport. Et pourtant… ce procès en cachait un autre: celui des sociétés d’externalisation de main d’oeuvre. Un cas plutôt embarrassant pour les entreprises françaises implantées en Malaisie, mais aussi un enjeu politique pour l’actuel gouvernement malaisien. C’était en février dernier. Pour la première fois en Malaisie, une entreprise privée poursuivait en justice un défenseur des droits de l’homme. Son crime ? Avoir dénoncé les conditions de travail de 31 Birmans, victimes des pratiques d’externalisation de leur employeur. Charles Hector est un avocat connu des travailleurs migrants. C’est donc naturellement vers lui que la communauté birmane s’est tournée lorsqu’elle a appris le sort de ses ressortissants, employés dans la filiale malaisienne d’Asahi Kosei, une entreprise japonaise d’électronique. Car porter plainte contre un employeur n’est pas simple pour les migrants “leur visa n’est accordé qu’à la demande de l’employeur”, explique Lateefah Koya, avocate malaisienne spécialiste de la question des réfugiés. Et la situation se complique dans le cadre d’une externalisation : “Lorsqu’ils portent plainte, on leur demande le nom de leur employeur. En cas d’externalisation, le nom ne figure pas sur le visa, les douaniers ferment un oeil”. Une plainte avait pourtant déjà été déposée auprès de la commission nationale des droits de l’homme (Suhakam) et du ministère des Ressources humaines. L’avocat demande des éclaircissements à Asahi Kosei : “j’avais prévenu l’entreprise que, sans réponse dans un délais raisonnable, je publierais les témoignages des travailleurs sur mon blog“, précise-t-il. Asahi Kosei réagit enfin: sans sommation, elle poursuit l’avocat pour diffamation, lui demandant pas moins de 2,5 millions d’euros. Les mois suivants, plusieurs dizaines d’organisations des droits de l’homme (Human Rights Watch, la FIDH, Aliran…) manifestent leur soutien à Charles Hector, contre ce qui apparaît en premier lieu comme une atteinte à la liberté d’expression d’un blogger. Fin août, la justice tranche: elle condamne Charles Hector à verser 1 ringgit symbolique à l’entreprise et à faire des excuses publiques. Ce faisant, elle rejette le témoignage des 31 victimes… laissant présumer qu’elle cherche à étouffer une affaire gênante pour les intérêts commerciaux de l’entreprise. We, the undersigned 115 organizations, groups and networks are disturbed that the Malaysian government has proceeded to table, and get it passed speedily on 6/10/2011 at the Dewan Rakyat (House of Representative) the Employment (Amendment) Bill 2011 despite protests from workers, trade unions and civil society. The proposed changes to the Employment Act would be most detrimental to worker rights, trade unions and the existing just direct 2-party employment relationship between worker and end-user (the principal). Malaysia’s action goes contrary to justice. In many countries employers have been wrongly trying to avoid/disguise employment relationships by way of contracts/agreements and triangular relationships, and Malaysia rather than fighting against this negative trend is now trying to legalize it, hence showing itself to be anti-worker anti-unions. We note also that the amendments would result in discrimination at the workplace, as many workers at a factory, plantation or any workplace would end up being no longer employees of the owner-operator of the said workplace, also referred to as the principal or end-user, but would remain employees of the supplier of workers, known as ‘contractor for labour’. Workers doing the same work at the factory, would be treated differently in terms of wages, work benefits and even rights by reason of the fact that their employers are different. This will also go against the Malaysian Federal Constitution that guarantees equality of persons. We advocate that all workers working at a factory or workplace are entitled to be treated equally in terms of wages, work benefits, rights, union rights, reliance on collective agreements and other entitlements. The proposed amendment would also destroy direct employment relationships between owner-operator of workplaces, being the principal, and the workers that work there producing the product or providing the services from which these principals derive their profits. A just employment relationship dictates that all workers should be employees of the owner-operator employer not some other third party labour supplier, whether they be known as ‘contractor for labour’, outsourcing agent or by any other name. The relationship must be a direct relationship, to the exclusion of all third parties, between the employer who needs workers to do the work to produce the goods of their business for profits, and the workers directly who provide the necessary labour as required in exchange for fair wages and other benefits. The availability of short-term employment contracts is another reason why there is no need to legalize triangular or other employment relationships in Malaysia through the creation of the ‘contractor for labour’. To fight for decent wages and rights, and to be able to negotiate and get better working conditions and other work benefits, workers at a workplace would generally come together collectively or as a union to be able to negotiate from a stronger position with employers, and this would result in agreements or ‘collective agreements’ between employers and workers (or their unions). If the amendments proposed become law, then many workers at the factory would effectively lose their rights to be able to form or be members of the trade union at the workplace, or the right to directly and effectively negotiate with the principal who effectively controls the work place, working conditions and benefits. If the proposed amendment becomes law, effectively it will also weaken existing workers and unions, by reducing their negotiating power for now when a strike or a protest in called, there will be other workers of other third party employers who will continue to work normally thus making worker struggle for better rights almost impossible. This proposed amendment is a ‘union busting’ exercises and allows employers to utilize ‘divide and rule’ tactics to counter legitimate demands of their workers and avoid employer obligations and responsibilities. Another unjustifiable proposed changed is the delay of payment of overtime and work on rest days by a month. With regard to sexual harassment, the new provision provides only for inquiry by employer even when the alleged perpetrator is a member of the management, a partner, shareholder and/or director of the employer’s business, and provides no clear right of appeal to the Labour Courts or the High Court. Note that other worker rights violations are currently all dealt with by the definitely more independent Labour Department or Industrial Relations Department. Remedy for the victim of sexual harassment is also absent, save maybe the right to resign without the need to give the required notice when the perpetrator is a sole proprietor. The Malaysian Trade Union Congress (MTUC), which represents over 800,000 workers of member unions, who is also is the accepted workers representative in Malaysia, picketed calling for the withdrawal of the amendments on 3/10/2011, and apparently despite the Minister assuring them that the amendment will only be tabled at the end of the month, was suddenly rushed and passed at the Lower House of Malaysia’s Parliament on 6/10/2011. Malaysia has the Private Employment Agencies Act 1971, whereby these agencies rightfully get workers for employers, who then pay them a fee for the service, and once workers are received by the employer, these workers immediately become employees of the said employer. The amendments will creates a new kind of labour supply companies who will continue as employers of the workers even after they start working at the workplace of the principal, and this is unacceptable. All companies in the business of finding workers for companies that need workers to produce their products or for their business must be private employment agencies, and must never assume or retain the role of employers. As the said Bill still needs to be passed by the Senate and receive royal assent, before it becomes law, we call on the Malaysian government to act in the best interest of workers and their unions and immediately withdraw this unjust proposed amendments to Employment Act 1955. We call on Malaysia to immediately discontinue its policy of recognizing outsourcing agents, and act immediately against practices of some employers and outsourcing agents that try to avoid/disguise employment relationships to the detriment of workers and unions. We call on countries and regional bodies, companies, ILO, trade unions and persons to do the needful to ensure that worker and union rights, not just of local but also migrant workers, are protected in Malaysia, and that the employment relationship continue to be between owner-operator end user employers who actually need workers to do work and the workers that work there to the exclusion of any third party labour suppliers or ‘contractors for labour’. Association of Migrant Child & Family, Bangladesh. PETALING JAYA: More than a 100 civil society groups locally and abroad have called for the government to withdraw ‘unjust’ amendments to the Employment Act 1955, ahead of a nationwide Malaysian Trade Union Congress(MTUC) picket on the same issue next week. In a joint press statement 107 civil society groups expressed concern over the government’s actions to “speedily” table and passed the the Employment (Amendment) Bill 2011 on Oct 6 at the Dewan Rakyat, despite protests from various groups against it. Confederation (ITUC), representing 175 million workers in 153 countries and territories and has 308 national affiliates. A spokesman for the group Charles Hector said: “Malaysia’s action goes contrary to justice. The groups noted that the amendments went against the Federal Constitution, which guaranteed equality of persons, as it would result in “discrimination at the workplace”. “Workers doing the same work at the factory, would be treated differently in terms of wages, work benefits and even rights by reason of the fact that their employers are different,” said the statement. The statement stressed that workers in the same workplace should be treated equality— in terms of wages, work benefits, rights, union rights, and so on. The civil groups also said the proposed amendments would also “destroy” direct employment relationships between owner-operator of workplaces. It stressed that such a “relationship” must be a direct relationship, and should exclude all third parties. “The availability of short-term employment contracts is another reason why there is no need to legalize triangular or other employment relationships in Malaysia through the creation of the ‘contractor for labour’ (system),” it added. If the amendments become law, then workers would also lose their rights to form or be members of the trade union at the workplace. This will subsequently affect their right to directly and effectively negotiate with the principal who effectively controls the work place, working conditions and benefits. This would also weaken existing workers and unions, by reducing their negotiating power, and in turn make workers’ struggle better rights wll become “almost impossible”. “This proposed amendment is a ‘union busting’ exercises and allows employers to utilize ‘divide and rule’ tactics to counter legitimate demands of their workers and avoid employer obligations and responsibilities,” said the groups. The groups also said the amendments further made unjustifiable changes to delay in overtime payment and work on rest days, as well as issues regarding sexual harrassment. Currently, worker rights violations are all dealt with by the “definitely more independent” Labour Department or Industrial Relations Department. “We call on Malaysia to immediately discontinue its policy of recognizing outsourcing agents, and act immediately against practices of some employers and outsourcing agents that try to avoid or disguise employment relationships to the detriment of workers and unions,” said the statement. The proposed Bill still needs to be passed by the Senate and receive royal assent, before it becomes law. It said that the country currently has the Private Employment Agencies Act 1971, whereby these agencies rightfully get workers for employers, who then pay them a fee for the service, and once workers are received by the employer, these workers immediately become employees of the said employer. “The amendments will create a new kind of labour supply company who will continue as employers of the workers even after they start working at the workplace of the principal, and this is unacceptable,” said the statement. It also explained that all companies in the business of finding workers for companies must never assume or retain the role of employers. Geneva-Paris, August 26, 2011. The Observatory for the Protection of Human Rights Defenders, a joint programme of the World Organisation Against Torture (OMCT) and the International Federation for Human Rights (FIDH), expresses its concern about the outcome of the judicial case against human rights defender Charles Hector Fernandez, who was sued by a company for publishing information regarding the violation of the rights of 31 Burmese migrant workers in Malaysia. On August 25, 2011, the case against human rights defender Charles Hector Fernandez before the Shah Alam High Court ended in a settlement between the defender and the company that had sued him for civil “defamation”. According to the settlement, Mr. Charles Hector Fernandez will pay 1 Malaysian Ringgit (less than one USD) in costs and the same amount in damages to the company, and will publish a half-page apology in the Malaysian daily newspapers The Star and Nanyang Siang Pau. Mr. Charles Hector Fernandez was sued in February 2011 by the Japanese-owned company Asahi Kosei, in Selangor, Malaysia, for publishing information on-line regarding the violation of the rights of 31 Burmese migrant workers by this company management. Asahi Kosei Company was demanding a compensation of USD 3.3 million, in addition to a public apology, with the argument that these 31 Burmese workers have not been under their responsibility, as they were supplied to them by an ‘outsourcing agent’. The Observatory sent an international mission to observe the trial against Mr. Charles Hector Fernandez and to investigate the situation of human rights defenders in Malaysia. “The case of Charles Hector Fernandez shows how powerful corporate interests are taking on and silencing a human rights defender by his horns. Using exorbitant civil libel claims against human rights defenders reporting alleged corporate abuse sends a dangerous precedent with a chilling effect on the legitimate work of human rights defenders”, said Ms. Sudha Ramalingam, following the observation of the trial. The Observatory is concerned that the human rights defender in this case was left with little choice other than accepting a settlement having the effect of sanctioning his activities as a defender of the rights of migrant workers. For many years, Mr. Charles Hector Fernandez has provided vital legal assistance to workers and migrants seeking justice. On the 25th August 2011 after an exhausting, expensive and exasperating six months Charles Hector and Asahi Kosei arrived at a settlement. 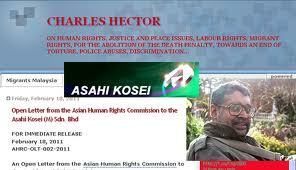 According to the settlement, Charles Hector will pay RM1 in costs and RM1 in damages to Asahi Kosei. A further condition that Charles Hector has to satisfy is the publication of a half-page advertisement in The Star national daily newspaper and in the Nanyang Siang Pau national daily newspaper . We hope that this court case acts as a wake up call for all stakeholders, including government authorities, international agencies, diplomats ,trade unions, business corporations, to urgently review mechanisms to uphold the rights of migrant workers and human rights defenders. Although the court case is over the situation of migrant workers still requires your vigilance and Charles Hector as a human rights defenders still requires your support. He has already incurred considerable debt during this struggle. Now he must find a further USD7000 urgently to pay for the advertisements required by Asahi kosei within the next 21 days. Bank account number: 107 246 109 510. Also, email to aliran@streamyx.com after making a donation to advise who it's from and what it’s for and the date of payment. We thank each and every one of you for your support and trust we will all continue to work in solidarity for social justice. Charles Hector, human rights defender, activist, blogger and lawyer, did highlight human rights worker rights violations affecting some 31 Burmese migrant workers, all of whom were working at a company, Asahi Kosei(M) Sdn Bhd, in his blog. The information provided by the workers. After they complaint about wages, wage deductions,.. they were threatened, there was attempts to send back workers to Burma, removal of electrical and cooking items and disconnection of electrical supply... Details of the said violations were then highlighted in the blog beginning 8/2/2011. A joint statement about this was also issued by 80 over groups on 11/2/2011. On 14/2/2011, the company sent a lawyers letter demanding USD3.2 million within 7 days, a public apology and the removal of the said postings or else they would file a legal suit. This attempt to silence, and the threat resulted in a response from civil society groups, including AHRC, Trade Unions, Bar Council and the Malaysian Bar. On 14/2/2011, the company did file the legal suit, and also an got ,amongst others, a 'gag' order' on 17/2/2011. All this were done without the knowledge of Charles Hector. The said order and the court documents was handed over to Charles Hector on 21/2/2011. To send an urgent appeal, go to AHRC website or here. The stay applied for was not granted by the Court of Appeal on 23/08/2011, and the trial at the High Court in Shah Alam is expected to proceed on the following day, i.e. 24/8/2011, 25/8/2011 and 26/8/2011. HR Defender, blogger and lawyer is being sued by Asahi Kosei(M) Sdn Bhd for highlighting injustices affecting 31 Burmese migrant workers working at the factory of the said company. Targeting those who highlight injustices is EVIL.